Even though it gray and rainy outside some exciting things are still happening at PTMSC. Chrissy was teaching a NOLS class on the dock when they pulled up these two amazing critters! A Pacific Spiny Lumpsucker and a Winged Sea Slug! 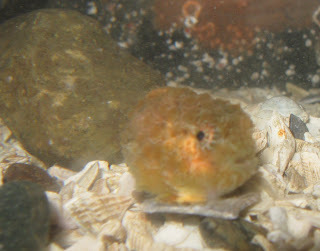 These are both rare finds in the Puget Sound so we are lucky to have found them! 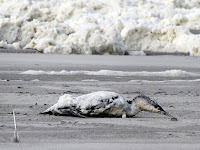 Sea foam...What the heck is it? 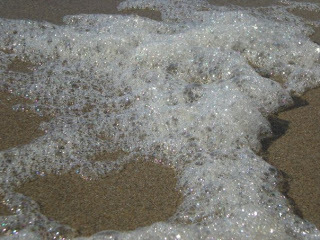 Have you ever walked down the beach and all of this foam is all over the beach? I have always wondered what it was and now I know!! 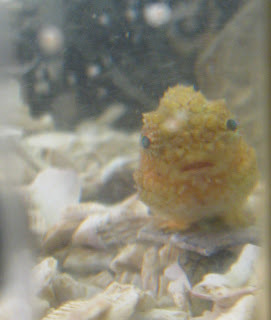 A volunteer sent me an e-mail with the subject line "Orcadontist". Several other volunteers thought it was brilliant and perfectly suited for this week's workshop and I agree! This week Libby, several devoted volunteers and myself created a set of 46 false teeth for our orca skeleton. These false teeth or "orca-dentures" (another clever term toss around) will be on display in the mouth of our articulated orca skeleton due to be on display later this spring. Why false teeth instead of real ones? It turns out killer whale teeth, when dried out, become very frail. Pieces can begin to flake off and even shatter. Also, returning the teeth to NOAA allows them to be studied in further detail. Although we know "Our Whale" is a mature female, the exact age has yet to be determined; also further knowledge about her diet can be learned through teeth analysis. We jump started the week with Step 1- Creating tooth molds. Making a perfect mold requires skills in mathematics, combined with the ability to work with clay and most importantly a steady finger. We divided into two groups. One group was responsible for mixing a 1:10 ratio of silicone goop and catalyst, while the other group built clay pedestals for our teeth. The final step in making the mold requires one volunteer to place a firm and steady finger on the very tip of the tooth, while another volunteer gently pours the "mold goop" until the tooth is completely submerged. By the time we reached the next step we had an article in the local paper and had become professional mold makers! Step 2-Teeth casting. Once our molds had set for the required 24 hour period we began the task of removing the teeth from the molds. Once teeth were removed we put on our mad scientist gear (goggles and gloves of course) and headed outside. The chemicals being used to create our casts were toxic and ventilation was a must! Lucky for us the epoxy used for casting only needed to sit for 30 minutes. It was great to see the results of our work so quickly. 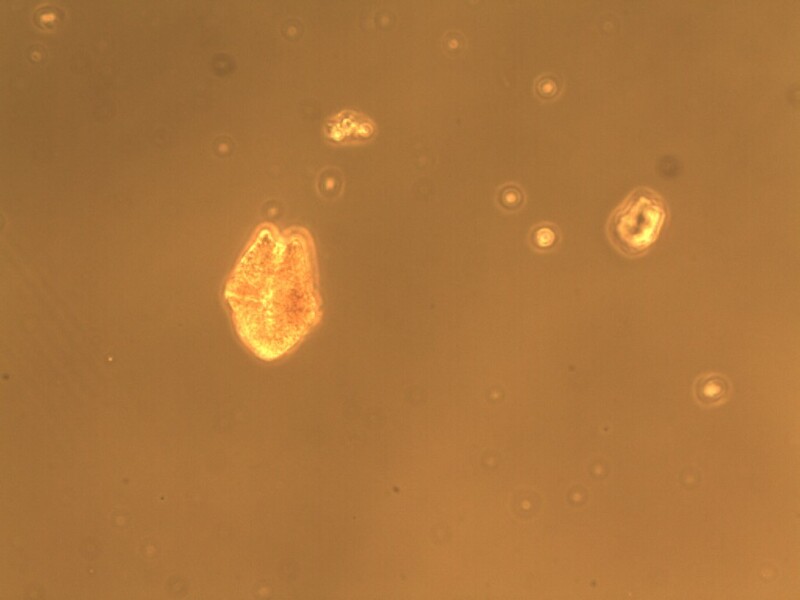 Every single mold created nearly identical casts! Results prove what great volunteers we had this week at the workshop. By Friday we reached our final step. Step 3- Teeth painting. Painting teeth was a change of pace from the rest of the week. It allowed us to express ourselves artistically and also just enjoy talking with one another around the table. By the end of the afternoon session Friday we had created 46 false teeth for "Our Orca". The work done this week was flawless! Several observers have already looked at the teeth and replied, "wait those aren't the real teeth? They look so real". I want to thank everyone who came and helped out this week. 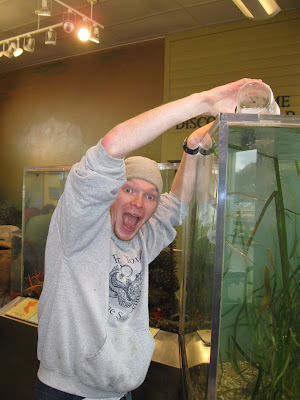 The Port Townsend Marine Science Center really does have amazing, passionate and devoted volunteers! Thanks for feeding me your knowledge and welcoming me into your community. What can I say, I've got the orca fever! Stormy weather has set in at PTMSC as if to show our loss. Jonathan and Angela, our amazing fall interns have left us, after bestowing all their knowledge to us. They taught us how to clean the tanks, cut up food, feed the animals, and open the exhibits...and so much more. 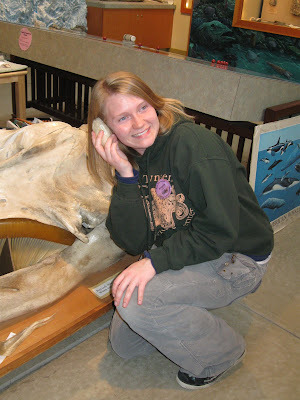 Angela with the whale skull. Tis the season of farewells! Not only did we have to bid adieu to our wonderful fall interns this week but we're also beginning the process of taking down the aquarium tanks! We're doing this because the Marine Exhibit is closed during the winter (except for the days immediately following Thanksgiving, Christmas and New Years). After the shells were all taken care of, we rinsed the walls and I set to work scrubbing out all the patches of algae clinging to the walls. Finally we rinsed the tank again, used a bilge pump to drain the remaining water and Julia mopped up the rest! The tank looks so empty now! In the coming weeks we'll be emptying out the other tanks in the cluster as well as the piling tank. Julia and I will be spending many hours this winter buffing out all the scratches that have accumulated during the year. You can even download a coloring poster to decorate your wall in classy eelgrass style! The Marine Exhibit is now closed (except for special Holiday weekends), but exciting things are still happening in the salty water. This Dungeness crab (Cancer magister) was releasing her eggs on Sunday afternoon. Usually these crabs lay eggs between spring and fall so this one is a little late. 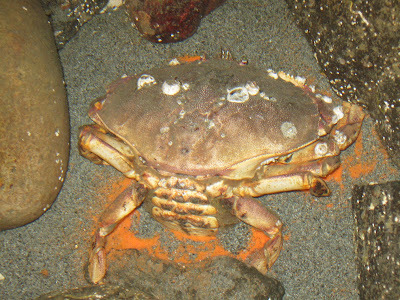 Male dungeness crabs only will mate with females that have recently molted, the female will keep the sperm until her eggs are fully developed. 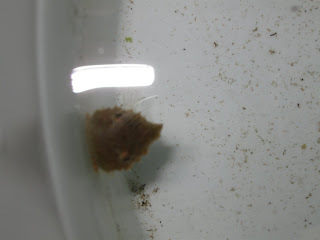 After the female releases the eggs they will go through a series of free floating planktonic stages, molting, changing and growing for up to a year, they then settle to the bottom as little crabs and begin their rough life in the ocean! At about 4 or 5 these species can weigh 2-3lbs and measure 6.5 inches across. If they can escape traps long enough they can also live up to 13 years! Make sure to come back to the Port Townsend Marine Science Center in the spring to catch some more egg laying action by our resident crabs and other animals!